My partner and booked this cruise as we felt like we needed a winter getaway. We also had a fantastic time on a January cruise in 2017 and wanted to explore more of the world using this excellent mode of transport. We are both in our mid 20’s and really enjoy hiking, exploring and just generally being active. The aim was to come back feeling relaxed but also like we gained new knowledge and experience. This would be our third cruise and first time with P&O. Embarkation and disembarkation I cannot fault, it is seamless from start to finish. We were on a charter flight and on arrival at Barbados we were whisked straight off the plane to the ship. We had no queue to check in and get our cruise cards created. On departure day everything is digitally signposted to make sure you know where you need to be and at what time. Our cases were taken the night before and immigration came onto the ship to handle our paperwork the day before we left. We were given our flight tickets around 4 days before departure along with our luggage labels and explanation of the process. The dedicated lane at the airport for cruise passengers was also super speedy, definitely the best we have encountered. Exercise & Leisure: There is a well equipped gym and running track on the upper deck, we used these everyday and found there was enough equipment for everyone without having to wait around (obviously there are peak times e.g. around 9am). There are free sessions such as the ‘morning stretch’ that you can sign up to along with classes such as spinning which come at a small fee. There is also a basketball court and golf area (no mini golf though which would be an excellent addition). Beside the gym is also the cookery school kitchen which looks fantastic, we did not get to experience this but there was always a variety of different classes advertised for a fee. The spa we did not use, on our first day at sea we went to have a look around at the thermal suite which appeared quite small plus it felt like a really hard selling approach to get us to purchase day passes. We did not receive our requested call back for availability and so we did not visit. There is also the ‘retreat’ open air spa terrace available for booking in conjunction with the thermal suite. 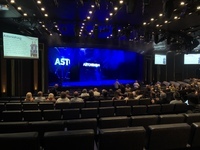 Entertainment & Activities: Everyday you will find a full program of things you can get involved in within the cruise personaliser which is dropped off outside your cabin each night along with port information. We played bingo in Brodie’s bar purchasing a pack for £15 which included 5 games and a bonus 3 tickets for one game. We also really enjoyed the aqua fit classes which took place in the lido pool which was free. Throughout the day there are quizzes, talks from aviation experts, reflexology sessions, you can book your next cruise or just sunbathe out on deck. You will also find usually 2 different films showing throughout the day in the studio, there’s a great selection for all. We only attended one show in the theatre which was called ‘astonishing’, I won’t spoil it for those that haven’t seen it but we found it entertaining given its interactive nature. Shopping: Within the main atrium midship you will find a selection of stores selling jewellery, clothing and alcohol. They did a number of flash sales on products but we still found everything very pricey, however they do come in handy when you have an emergency such as not packing your tie (will set you back £12). Just opposite reception you will find another store selling biscuits, suncream, merchandise, playing cards (£3) and amongst other things the washing tabs you need for the washing machines (£1 each). 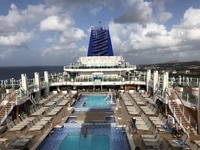 Food and drink: I cannot tell you how many bars there are on this ship, they are everywhere! You can also get costa coffee at select places also. 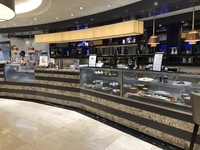 The market cafe on deck 5 also sells wonderful looking cakes and bakes designed by Eric Lanlard and also crepes and ice cream. We were allocated to second sitting dining (8:30pm) in the Oriental restaurant on a table for 2. I don’t eat food containing dairy and informed our travel agent when booking and I was looked after fantastically. I ordered my food the day before getting a sneak peak of the menu and everything was cooked for me with the same choice as everyone else minus the dairy. Our waiters were phenomenal and they really added to our meal times. We had 4 formal nights and the dress code is strict so don’t forget your tie or suit jacket! The horizon buffet is also always well stocked; if you need help with a dietary requirement you can ask the staff in the yellow ‘how can I help’ aprons. You have everything available at breakfast including cooked breakfast, fruit, pastries, pancakes, cereal, yoghurt, juice. Lunch is always something different but you can always have salad, fish and cold meats, soup along with a wide selection of hot dishes. Afternoon tea is served in here from 3pm and also in the oriental restaurant from 4-4:45pm. There are always numerous cakes, sandwiches, pies, scones, crumpets and unlimited tea. Outside either side of the lido pool you will find a grab and go section for quick sandwiches, fruit, salad etc at lunch and also pizza, burgers, hot dogs and chips served until around 6pm. There is also Jude’s ice cream and costa coffee here too. We also chose to pay extra to dine in Eric Lanlards restaurant ‘The Epicurean’ for afternoon tea. It was fantastic with a wonderful selection of food and experimental desserts along with a large choice of tea (including chocolate tea). The decor is also very light and airy, this is a must for any foodies and it was extremely reasonable price wise. You can also dine at other restaurants such as Sindhu and the Limelight Club (evenings entertainment by a known performer) for a fee. Ports & Excursions: We had a fantastic itinerary and loved each of the ports we visited. Our favourites were Grenada, Dominica & St Lucia. We booked the eco trek for Grenada which led us through a plantation, learning about all of the spices, plants and fruits the island holds. We then ended up at a waterfall in which you can take a refreshing dip. Our tour guide was fantastic however if you struggle walking up pretty steep hills on a continuous incline then this may not be for you as the way back is pretty much all uphill. We also had a to cross a river barefoot but this was all part of the fun! In Dominica we booked the hot springs trip. We swam through a gorge which was also one of the film areas for Pirates of the Caribbean, then onto the Bongo Baths which were wonderful. Naturally heated pools of water at different temperatures in a tranquil setting. You do have to take a dip in the cold before leaving to get your pores closed up (leaving open leaves you vulnerable). St Lucia we planned ourselves and already researched that we wanted to go pigeon island. I’m the port are there are always numerous people asking if you need a taxi, we paid $40 return for two with a pick up later in the afternoon. We had a fantastic time climbing up hills, taking in the scenery and relaxing on the beach; you must also visit Jambe de Bois for food and cocktails, it is fantastic! I would say don’t be afraid to do some pre trip research as shore excursions can be expensive. In Antigua we booked kayaking and snorkelling. Our guides/instructors were really superb and we had an awesome day, pretty arm intensive at the start but all worth it! 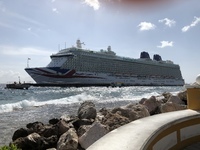 We saw lots of beautiful sea creatures and enjoyed a few cups of rum punch in the sunshine. I would personally substitute Çuracao with Trinidad & Tobago as this port was the least active for us. We explored the local area and the Kura Hulanda museum but beyond this we would have needed to go further out to find some more activities. Cabin: We had an inside cabin which we found to be excellent value, we spent so much time out of our room we didn’t feel the need to book a balcony. The queen bed was great and very comfy plus we had numerous storage spaces and an adequate size bathroom. Our housekeeper cleaned at least twice a day, we could not fault how clean the cabin was. Overall we had a fantastic trip, we really did not want to come home! We want to travel with P&O again and cant wait for our next cruise. My partner and booked this cruise as we felt like we needed a winter getaway. We also had a fantastic time on a January cruise in 2017 and wanted to explore more of the world using this excellent mode of transport. We are both in our mid 20’s and really enjoy hiking, exploring and just generally being active. The aim was to come back feeling relaxed but also like we gained new knowledge and experience. This would be our third cruise and first time with P&O. Embarkation and disembarkation I cannot fault, it is seamless from start to finish. We were on a charter flight and on arrival at Barbados we were whisked straight off the plane to the ship. We had no queue to check in and get our cruise cards created. On departure day everything is digitally signposted to make sure you know where you need to be and at what time. Our cases were taken the night before and immigration came onto the ship to handle our paperwork the day before we left. We were given our flight tickets around 4 days before departure along with our luggage labels and explanation of the process. The dedicated lane at the airport for cruise passengers was also super speedy, definitely the best we have encountered. There is a well equipped gym and running track on the upper deck, we used these everyday and found there was enough equipment for everyone without having to wait around (obviously there are peak times e.g. around 9am). There are free sessions such as the ‘morning stretch’ that you can sign up to along with classes such as spinning which come at a small fee. There is also a basketball court and golf area (no mini golf though which would be an excellent addition). Beside the gym is also the cookery school kitchen which looks fantastic, we did not get to experience this but there was always a variety of different classes advertised for a fee. The spa we did not use, on our first day at sea we went to have a look around at the thermal suite which appeared quite small plus it felt like a really hard selling approach to get us to purchase day passes. We did not receive our requested call back for availability and so we did not visit. There is also the ‘retreat’ open air spa terrace available for booking in conjunction with the thermal suite. 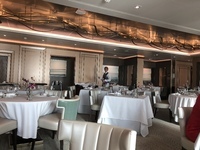 Everyday you will find a full program of things you can get involved in within the cruise personaliser which is dropped off outside your cabin each night along with port information. We played bingo in Brodie’s bar purchasing a pack for £15 which included 5 games and a bonus 3 tickets for one game. We also really enjoyed the aqua fit classes which took place in the lido pool which was free. Throughout the day there are quizzes, talks from aviation experts, reflexology sessions, you can book your next cruise or just sunbathe out on deck. You will also find usually 2 different films showing throughout the day in the studio, there’s a great selection for all. We only attended one show in the theatre which was called ‘astonishing’, I won’t spoil it for those that haven’t seen it but we found it entertaining given its interactive nature. Within the main atrium midship you will find a selection of stores selling jewellery, clothing and alcohol. They did a number of flash sales on products but we still found everything very pricey, however they do come in handy when you have an emergency such as not packing your tie (will set you back £12). Just opposite reception you will find another store selling biscuits, suncream, merchandise, playing cards (£3) and amongst other things the washing tabs you need for the washing machines (£1 each). I cannot tell you how many bars there are on this ship, they are everywhere! You can also get costa coffee at select places also. 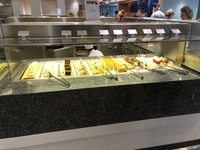 The market cafe on deck 5 also sells wonderful looking cakes and bakes designed by Eric Lanlard and also crepes and ice cream. We were allocated to second sitting dining (8:30pm) in the Oriental restaurant on a table for 2. I don’t eat food containing dairy and informed our travel agent when booking and I was looked after fantastically. I ordered my food the day before getting a sneak peak of the menu and everything was cooked for me with the same choice as everyone else minus the dairy. Our waiters were phenomenal and they really added to our meal times. We had 4 formal nights and the dress code is strict so don’t forget your tie or suit jacket! The horizon buffet is also always well stocked; if you need help with a dietary requirement you can ask the staff in the yellow ‘how can I help’ aprons. You have everything available at breakfast including cooked breakfast, fruit, pastries, pancakes, cereal, yoghurt, juice. Lunch is always something different but you can always have salad, fish and cold meats, soup along with a wide selection of hot dishes. Afternoon tea is served in here from 3pm and also in the oriental restaurant from 4-4:45pm. There are always numerous cakes, sandwiches, pies, scones, crumpets and unlimited tea. Outside either side of the lido pool you will find a grab and go section for quick sandwiches, fruit, salad etc at lunch and also pizza, burgers, hot dogs and chips served until around 6pm. There is also Jude’s ice cream and costa coffee here too. We also chose to pay extra to dine in Eric Lanlards restaurant ‘The Epicurean’ for afternoon tea. It was fantastic with a wonderful selection of food and experimental desserts along with a large choice of tea (including chocolate tea). The decor is also very light and airy, this is a must for any foodies and it was extremely reasonable price wise. You can also dine at other restaurants such as Sindhu and the Limelight Club (evenings entertainment by a known performer) for a fee. We had a fantastic itinerary and loved each of the ports we visited. Our favourites were Grenada, Dominica & St Lucia. We booked the eco trek for Grenada which led us through a plantation, learning about all of the spices, plants and fruits the island holds. We then ended up at a waterfall in which you can take a refreshing dip. Our tour guide was fantastic however if you struggle walking up pretty steep hills on a continuous incline then this may not be for you as the way back is pretty much all uphill. We also had a to cross a river barefoot but this was all part of the fun! In Dominica we booked the hot springs trip. We swam through a gorge which was also one of the film areas for Pirates of the Caribbean, then onto the Bongo Baths which were wonderful. Naturally heated pools of water at different temperatures in a tranquil setting. You do have to take a dip in the cold before leaving to get your pores closed up (leaving open leaves you vulnerable). St Lucia we planned ourselves and already researched that we wanted to go pigeon island. I’m the port are there are always numerous people asking if you need a taxi, we paid $40 return for two with a pick up later in the afternoon. We had a fantastic time climbing up hills, taking in the scenery and relaxing on the beach; you must also visit Jambe de Bois for food and cocktails, it is fantastic! I would say don’t be afraid to do some pre trip research as shore excursions can be expensive. In Antigua we booked kayaking and snorkelling. Our guides/instructors were really superb and we had an awesome day, pretty arm intensive at the start but all worth it! We saw lots of beautiful sea creatures and enjoyed a few cups of rum punch in the sunshine. I would personally substitute Çuracao with Trinidad & Tobago as this port was the least active for us. We explored the local area and the Kura Hulanda museum but beyond this we would have needed to go further out to find some more activities. We had an inside cabin which we found to be excellent value, we spent so much time out of our room we didn’t feel the need to book a balcony. The queen bed was great and very comfy plus we had numerous storage spaces and an adequate size bathroom. Our housekeeper cleaned at least twice a day, we could not fault how clean the cabin was. Overall we had a fantastic trip, we really did not want to come home! We want to travel with P&O again and cant wait for our next cruise. Our cabin had a queen bed configuration which felt huge but it didn’t make the room feel cramped. The clothes hanging area is great, enough room to park your cases, shoes etc on the floor whilst it leaves ample room to walk to and from the bathroom. The bathroom had a shower, it felt a little cramped in there especially as the shower door opens outwards which then blocks access to the toilet, the shower itself was great. We did have a rather interesting yellow stain on the carpet and a few scuffs on the walls however the cabin was always clean with the help of our fantastic housekeeper. The cabin itself was located right beside the crew access stairs etc but we did not hear a thing. The laundrette is just down the hall and the closest stairs are at the aft of the ship. 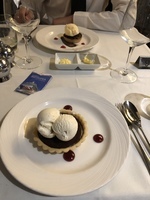 You are only 3 decks up from the Oriental restaurant if you are dining here which is excellent when you need to escape quickly to have a rest after all of the amazing food you ate! Really great 1.5 hours almost kayaking. We learned about the marine life in the waters and the advantages of mangroves. There were 2 people per kayak, the area which we explored we were boated out to. We had around 25 mins in the water snorkelling and saw lots of marine life and coral reefs. Equipment was provided along with rum punch! We took the local bus which cost $5 return per person to eagle beach then walked up to the butterfly farm. Fantastic place to learn about these creatures and spend time sitting watching them fly around. Entry was $15 per person. We then chilled on the beach for the rest of the day. There are a lot of resorts around this area so you can find something to eat and plenty of vendors renting out jet skis, snorkels etc. Copacabana Beach club is a great place to hang out if you’re just looking for a relaxing day at the beach. We also took a taxi to Carlisle Bay Area ($5 return per person) to go and snorkel with turtles and see the shipwreck ($40 for two), make sure you get out early to ensure you can see the turtles. Be sure to plan this port if you want to maximise your day. We visited a museum and explored the centre, not a whole lot to do here. The bongo baths were fabulous. Each pool is at a different temperature the first being the hottest so it is nice to end up in this one. Such a relaxing environment but you need to dip in the cold before leaving to close up those pores. A very refreshing swim, the space is enclosed but still enough to feel comfortable. A scene from pirates of the Caribbean was also filmed here. There is a waterfall near the end which can be used as a makeshift slide! We all wore flotation aids and our guides carried life rings. Would recommend this to people who like walk and learn about nature. We got so many hints and tips from our guide who was so knowledgeable about natural remedies and more. Be careful if you struggle with steep climb or rocky rivers. Be sure to take a dip under the waterfall! We spent the day on pigeon island. $40 taxi for 2 return, $7 entry to the park area and you can spend the day walking, sunbathing and eating. Must visit Jambe de Bois for excellent food and drinks at really great prices. Plan your day here for activities of which there are many. We stayed on Great Bay beach and looked around the port area. You will also find the longest zip line near the port too. We took a taxi for $60 which took us to Wallilabou Bay where pirates of the Caribbean was filmed then onto a nature reserve. We got dropped off at the botanical gardens, $7 for a guided tour and well worth a visit.